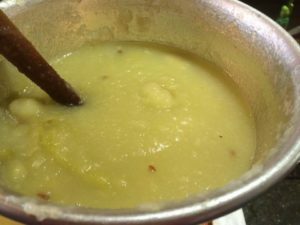 You can choose the kind of apples you use to make your own homemade applesauce. The choices are as many as the opinions on which type is the best. I’ve used yellow delicious and golden delicious, which work well. I’ve used Grimes Golden and I’ve used Mutsi Crispin. Summer Rambo is another brand that is a favorite. All of them work well. You will want an apple that is a little tart and not too soft. You will also want one that is sweet because you will need to add less sugar (or no sugar at all) if the apple is sweet enough. 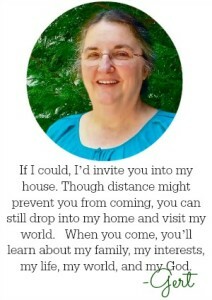 When our kids were small, we begged apples off neighbors who were letting their apples drop to the ground. They were happy to have us come pick the apples so they didn’t have to deal with the rotten apples on the ground. I never did find out exactly what kind of apples we were using, but it didn’t matter. The apples were free, the sauce was tasty, and I had plenty of free labor from my kids. It was common for me to can 50+ quart of applesauce at a time. One summer my sister-in-law and I (with our kids and later some help from our husbands) canned over 100 quarts of applesauce and 40+ quart homemade apple pie filling. I’m not sure our kids ever forgave us for putting them to work when they came home from their first day of school that August! In the past few years, I’ve been able to get Mutsu Crispin apples. 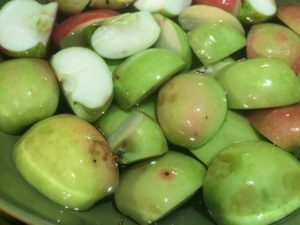 These apples are green to start but then turn a dark red. I store the apples in a cool room for a few weeks and turn them, watching them change from green to yellow to red. I don’t need to add any sugar to these apples. 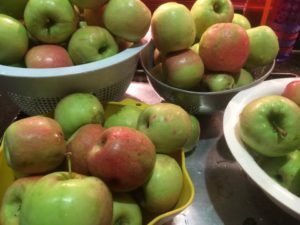 This fall I was given two bushels of a yellow-green-red apple that was firm and sweet. I don’t know what kind they were, but they were so sweet that I did not need to add any sugar. These apples are the ones you see in these photos. 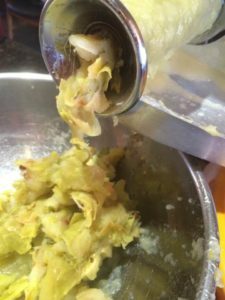 With this method, a squeezo-strainer makes quick, easy work of forming sauce from the cooked apples, peels and all. If the apples are small, I cut them in half and throw them into the kettle to cook. You do not need to remove the stem or the seeds. If the apples are large, I quarter them. The smaller the pieces, the less time it will take to cook them down. 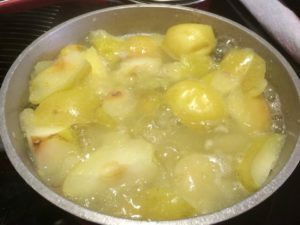 It’s better to cook the apples slower because the sauce will be less runny. You’ll figure out how high to have your burner after you have cooked a kettle or two of apples. Let’s get started! Homemade Applesauce is not hard to do! Wash your jars, jar rings, and lids so they are clean. I usually put my jars and rings through the dishwasher. I rinse the new rings in hot water in a stove-top kettle. Check the tops of the jars to make sure there is a smooth surface and no dents in the top, or the lids will not seal. Use canning jars and do not use jars that have a nick on the top. Set up your squeezo-strainer and run a little bit of water through to make sure all places have a tight seal. Gather your apples and wash them thoroughly in cold water. Drain the apples. I use several colanders set on a large tray. Slice apples into halves or quarters (depending on how large they are) and put them into salt water. The salt keeps the apples from turning brown. Just sprinkle a dash or two in the water. When you are ready to start cooking, put apples into a kettle and add water. 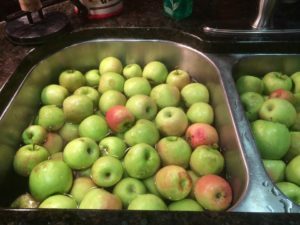 If the apples are drier, you will need to add more water. For some apples, I barely have the bottom of the kettle covered. For others, you might need to fill the kettle half full. 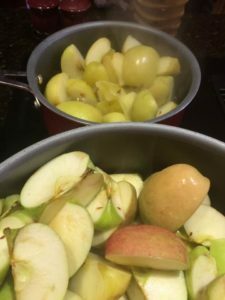 You want the apples to cook without being runny but without sticking to the bottom of the kettle. You’ll figure it out with a little trial and error, especially after you’ve cooked a kettle or two of apples. Cook until the apples are soft. They need to be soft enough to run through the sieve but not so soft that they are mushy. Remove the cooked apples from the stove top and put them into the colander of your squeezo. Reminder: keep small children away from this step so they will not get splattered with sauce and get burned! The seeds that you see will go through the colander and be pushed out with the peelings. My neighbors came to help me one day! The wooden “stomper” helps push the sauce through the strainer. The sauce goes down the tray and the peelings come out the other side as the handle is turned, helping to move things along. Here is the sauce coming down the “slide”. The seeds and peelings come out this side. We feed this to our cows, who wait anxiously by the fence for this treat! Put the sauce into a container and TASTE it FIRST. You might not need to add any sugar! Remember that it will taste sweeter once it has cooled, so don’t add too much sugar. Start with 1/4 cup in an 8- quart container, then taste before adding more sugar. 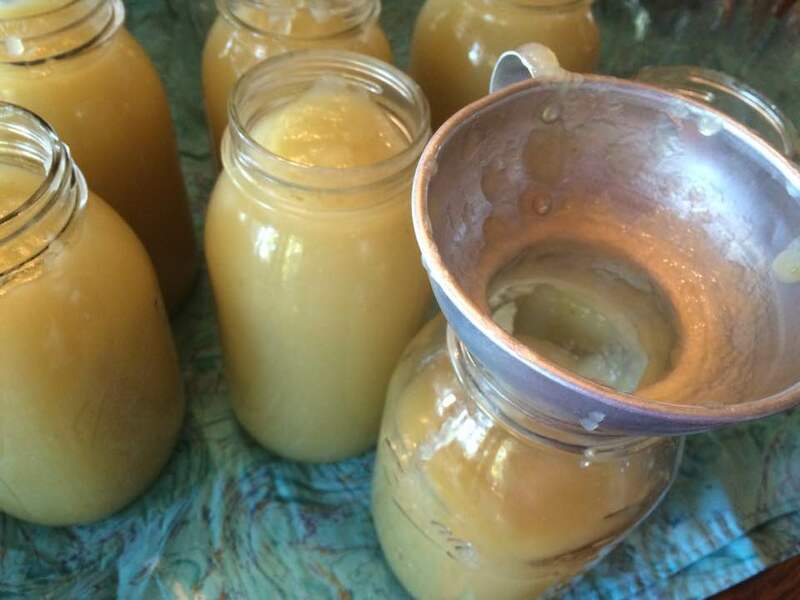 When your applesauce is seasoned right, put the sauce into the jars. Wipe the edge of the rim carefully, then add the lid and the ring, making a tight seal. Process the sauce in the jars according to hot water bath or pressure canner directions. When you remove the jars from your hot water bath or canner, the lids might not be sealed yet. Don’t panic. Give it time, and soon you’ll hear the ping! ping! ping! 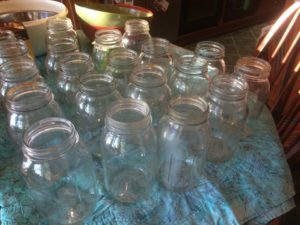 of jars sealing. Let your jars cool. Wait at least twenty-four hours to move them. This helps everything settle and lets you check to make sure all the lids have a tight seal. Plus, it’s so much fun to look at those rows of freshly-canned applesauce! Once the jars are sealed, you can remove the rings and re-use them for more canning. There you have it. 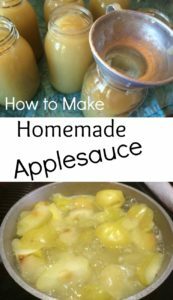 It’s a lot easier than it seems, and the extra effort is worth the trouble because you know exactly what is in your homemade applesauce. There’s a satisfaction in knowing that you are the one who controls what goes into the food your serve at your table. 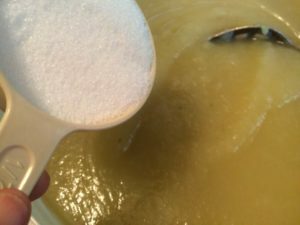 Nowadays, 99% of my applesauce is sugar free. Choose the right apple, and you can serve the best at your table, too. This post contains links for products. Purchasing these products may provide income for maintenance of this blog at no additional cost to you. 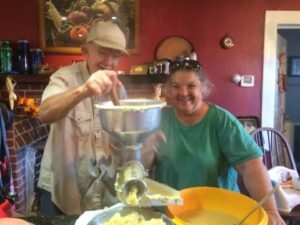 If you are interested in the equipment used to make applesauce, here are some suggestions. I use a metal squeezo-strainer. I think the plastic one squeezo would work, but I think the metal one is more durable. The secret in using the metal one is making sure it is washed and dried thoroughly so rust will not occur. I also have two different pressure canners, which I use. The two listed here are the type I use currently. 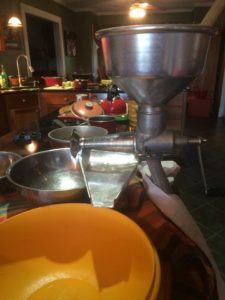 The apple slicer/corer/peeler is what I use when I make homemade apple pie filling. 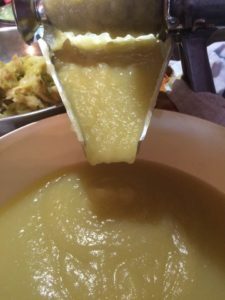 If you want to make applesauce without using the squeezo-strainer, then I recommend something that peels and cores the apples to make life simple for you.